Sold – Bressert System parts #1 & #2 have been sold. Buying (or shorting) 3 parts simultaneously and then selling (or covering) one part on 3 separate dates is very confusing to list. The initial 3 steps up (or down) means part #1 is liquidated (lock in the profit). Trend warnings and sell notices mean another part is liquidated (lock in more profit on part #2). Depending on the importance of the turn or warning, part #3 could be liquidated. At some point another 3 part purchase (or short) begins the cycle again. If you followed my tweets this morning, you would have seen me nail the bottom in real time (my bottom tweet was at 7:02 AM PDT). First bottom in the SPX futures contract was at 6:50 AM PDT, second bottom was at 7:16 AM PDT, difference between the 2 bottoms was 70 cents (first bottom was lowest). After the close, I said we had 3 steps up and should correct again. Now let’s watch the correction to see if it stays above the morning low and the market continues higher. If that happens, the next rally would be step 2 up from this morning’s bottom. If the low doesn’t hold, we will be off into step 2 down of the correction. The rally began today at SPX 1337 (Jeff Saut’s target zone). Below SPX 1290 significantly or for very long would make Jeff Saut very anxious. We’ll see what happens (as always). When viewing my tweets, you need to “expand” them to see the actual time that I filed the note. The h or m immediately to the right of my icon is only an estimate. The following tweets have been expanded. Looks like 2 steps up since this morning’s low. We “should” have step 3 and then down more. Gotta keep our options open for trend changes. FTSE has a higher bottom. We “could” rally right now. We’ll see, but I have to take RV in for service. I miss all the fun. Damn! Larger bottom could come later in the week with a sustained rally. I could be counting sub-divisions of a wave??? First higher high & higher low confirms a bigger rally. Overall probably more on downside. That’s one rally. The next rally will be more sustained. Probably a double bottom & then up. Soon! Continuing from last note – the larger rally should begin today. Wall Street folklore suggests that in 10 years any fool can make every mistake there is in the stock market and that a really smart person can do the same in half the time. I don’t know how long it took me, but I have tried to learn from those mistakes and avoid repeating them! Indeed, everybody who finally learns how to make money in the stock market learns his own way. I like this tale. Right after I was discharged from the Army at the close of World War II and went into the drilling-rig building business, I began buying and selling stocks on the side, at first as a hobby. At the end of each year I always had a net loss. I tried every approach I would read or hear about: technical, fundamental, and combinations of all these, but somehow I always ended up with a loss. It may sound impossible that even a blind man would have lost money on the rally of 1958 – but I did. In my in-and-out trading and smart switches I lost a lot of money. I introduced myself. The stranger, to my surprise, was happy to talk about stocks. He pulled a sheet of paper from his pocket with his list of stocks scrawled in pencil on it that he had just finished selling and let me look at it. I couldn’t believe my eyes! The man had made over 50% long-term-capital-gain profits on the whole group. One stock in the group of 30 stocks had been shot off the board, but others had gone up 100%, 200%, and even 500%. He explained his technique, which was the ultimate in simplicity. When during a bear market he would read in the papers that the market was down to new lows and the experts were predicting that is was sure to drop hundreds of points more on the Dow, the farmer would look through a Standard & Poor’s Stock Guide and select around 30 stocks that had fallen in price below $10 – solid, profit-making, unheard of little companies (pecan growers, home furnishings, etc.) – and paid dividends. He would come to Houston and buy a $50,000 ‘package’ of them. And then, one, two, three, or four years later, when the stock market was bubbling, and the papers were talking about the Dow soaring to new highs, he would come to town and sell his whole package. It was as simple as that. Well, it’s not quite that simple. You have to go against conventional wisdom following this type of investing philosophy. You have to learn how to go opposite of the markets. You have to be smart enough and brave enough to see that sometimes the emperor has no clothes. Most people want to follow the crowd; in essence, they want to follow the popular trend. Remember in February 2000 when the popular trend was “tech” and the conventional “call” was, “The Internet-related companies are the only ones worth owning right now!” Well, gold was the buy back then not tech stocks. Indeed, in this business it often pays to buy “panic” and “sell” euphoria. Wait until markets start moving in [price] gaps. The hysteria, in and of itself however, is only a catalyst to make us look and see what’s going on. It does not mean you have to do anything. Look for hysteria to see if you should go the opposite way, but don’t go the opposite way until you have fully examined it. Also, remember that the world is always changing. Be aware of change. You should be willing to buy or sell anything. So many people say, ‘I could never buy that kind of stock.’ ‘I could never buy utilities.’ You should be flexible and alert to investing in, or selling, anything. Most recently, corn has been gapping to the upside in the charts, as can be seen in the attendant chart on page 3. It was back on May 21, 2011 when I first mentioned corn’s “lift off” move by scribing, “Interestingly, the big winners last week were wheat (+15.2%) and corn (+9.3%), possibly because the Intercontinental Exchange (ICE/$131.09/Strong Buy) began trading grain future contracts for the first time.” Subsequently, corn prices have soared some 43% as the drought sweeping the Corn Belt has devastated the corn crop. Also impacting corn prices has been the drought in Russia. While the simultaneous droughts are tragic (June was this country’s third driest month in 118 years), global production of corn is still expected grow smartly. Meanwhile, back at the ranch, ranchers are liquidating their cattle herds because the cost of grain to feed them is crushing profit margins. So while grain prices are “on stilts,” the rush to the slaughter house has left cattle prices under pressure. Ladies and gentlemen, the gestation period for a cow is longer than that of a woman (~290 days vs. ~260). Moreover, a cow can only have one calf per year. Indeed, the beef cattle cycle is not like that of a “dark” assembly plant where you can just flip a switch and start producing widgets. Verily, once the herd is liquidated it takes a long time before beef production can ramp back up. The insight is that once the liquidation process is complete, beef prices should start to rise with positive investment implications for select companies. At the same time, when it becomes apparent that while our grain crops are in trouble world supplies are not, the current upside “euphoria” in corn prices should subside. As a sidebar, wheat speculators have their largest “net long” long position since 1998; and such extremes have tended to be a contrary indicator. Indeed, buy panic and sell euphoria. While commodities are “gapping” upward, the stock market is not, as last week was the mirror image of the previous week. To be sure, the previous week saw declines until Thursday’s Dow Delight (+203) erased those losses. Last week saw the early week gains evaporate with Friday’s Dow Dump (-120). Friday’s Fade should have come as no surprise to listeners of these comments, for in Thursday morning’s strategy comments I opined, “For short-term trading types, I think we either stall today (Thursday) at slightly higher prices, or we get a pullback off of some kind of intraday high today.” The media’s causa proximafor the late week slide ranged from weakening economic reports (five of last week’s reports were better than expected, nine were weaker, and two in-line), softening earnings reports (61.4% of companies’ reports have beaten estimates, 44.1% have beaten revenue estimates, but only 2% have raised forward guidance), the nastiest Presidential campaign ever, the approaching financial cliff combined with an intransigent Congress, Euroquake, etc. However, I think the overriding reason for the sell-off was the Spanish Finance Minister’s statement, “There is no money in the public coffers [and] there is no money to pay for public services.” With that statement, the yield on the 10-year Spanish sovereign debt found itself back above 7% (for perspective, however, recall that in 1993 / 1994 Spanish debt yields were hovering around 13%). Adding to the negative environment was that Germany’s wealthiest state (Bavaria) is openly protesting bailing out the “Greeces” of the world and is taking that protest to court. The call for this week: In Thursday morning’s verbal strategy comments I said I was looking for a trading top off of that day’s intraday “high,” but that I didn’t think the subsequent selling would gain much downside traction. The reasons for said stance are that my proprietary money flow indicators showed the decline was more about a withdrawal of buying power rather than a pickup in selling pressure, there was only one “top warning” from my indicators, my “risk indicators” were down on all indices, Wall Street strategists have the lowest allocation to equities in 15 years, and the AAII bullish sentiment reading dropped from 30.2% to 22.2% for the largest weekly wilt since April. Historically, with AAII readings this low the SPX saw a move higher every time. So, this continues to look like a typical pullback after a nice run to the upside rather than the beginning of a major correction. Nevertheless, the recent rally has been the weakest rally from an intermediate cycle low since the cyclical bull market began in March 2009. Moreover, despite last Friday’s upward bias option expiration the equity markets closed near the lows for the sessions and that is a distinct change of pattern. And this morning we see why given the news from abroad. If futures open where they are indicated it would put the SPX back down into the 1330 – 1340 support zone. Failing that support brings into view the often mentioned 1290 – 1300 level. I continue like the strategy of gingerly accumulating the non-stock market correlated names so often featured in these reports as we await a decisive/sustained upside breakout above the 1360 – 1366 level. Jeffrey Saut of Raymond James is a very savvy guy and one of the few people that I follow. I found Jeff among the talking heads on CNBC, which is normally filled with worthless bobble-headed people. When I saw Jeff the first time, he was telling the audience different ideas than what everyone else was regurgitating. Immediately this catches my attention because I’m ALWAYS interested in anyone that has a mind apart from Wall Street. After listening to him over time, I realized this guy is smart, insightful and normally right on the mark. I find people like this very infrequently. He reminds me of Robert Farrell of Merrill Lynch (70s and 80s), who achieved a large following by being frequently on target. Jeff Saut is an acknowledged student of Bob Farrell. The following is an illustration of Edson Gould’s uncanny abilities as a market technician. This is from my copy of “Edson Gould’s 1974 Forecast” issued in Feb 1974. The peak was 1067 on January 11, 1973. 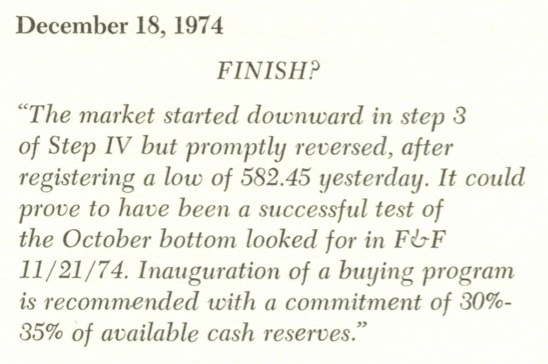 The January 1973 sell recommendation was also remarkable. It proves that Gould was an excellent wave counter because there is no other method of hitting a peak within 3 days. He staked his reputation on that sell recommendation and became a huge bear at that point. Other good methods can put you in the ball park, but not within 3 days. He was issuing a seldom used sell recommendation and in hindsight he was dead on correct. He knew that a big bear market had just begun, one that would carve off about 50% of the market’s valuation. And then on December 18, 1974, he declared the bear market dead and issued a buy recommendation. He was the greatest!!! At that time, I wouldn’t have dared to disagree with the master, but many years later I thought his labeling of the bear market was incorrect. Horrors – sacrilegious and blasphemous lies against the master. Yeah, it is pretty bad but I only have room for 3 or 5 counts in my method. Gould miscounted and should have called the end to the bear on the October 1974 bottom. This became evident when we only had 2 steps up before the next sustained correction. Counting October as step 1 up, everything lined up very nicely with 3 steps up. Plus we would only have 3 steps down instead of 4. It’s just one of those debatable points where it doesn’t really matter how you called it because either way made you lots of money and that’s the end game to what we do here. This entry was posted on July 23, 2012 at 6:18 PM and is filed under 2 - EDSON GOULD, JEFF SAUT, UPDATE. You can subscribe via RSS 2.0 feed to this post's comments. You can comment below, or link to this permanent URL from your own site.